The ozone layer in the stratosphere has an important role in absorbing UV light radiation (ultraviolet) emitted from the Sun to the Earth. A number of compounds, the amount is reduced. Compounds that can destroy ozone is a compound best known as a cause of ozone depletion is the chlorofluorocarbons (CFCS), which comes mainly from aerosols, refrigerators, and air conditioning (AC). Other compounds that also can cause ozone depletion is methyl bromide can be found in pesticides and methyl chloroform and carbon tetrachloride that are widely used as a solvent in the industry. The thinning of the ozone layer causes the majority of UV light radiation emitted to the Earth's surface. UV light has a bad impact towards living creatures, of which cause mutations, skin cancer, diseases in plants, and ultimately decrease the populations of living things. A very drastic ozone depletion has been observed Antarctic region between the years 1970 to 1990 's. In this region, the rate of ozone depletion is very large so that it looks like a hole. 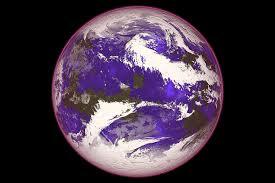 In 1998, in the region of the Antarctic ozone hole recorded has reached 27.5 million km2 wide. Research shows that declining populations of phytoplankton and fish in Antarctic waters is directly related to ozone depletion. Currently, efforts to prevent the occurrence of further ozone depletion has a lot to do. One way of reducing the production of ozone destruction compounds such as CFCS. Global warming is the incidence increasing the average temperature of the Earth. Global warming is happening due to the greenhouse effect caused by greenhouse gases. Do you know what is the greenhouse effect? The greenhouse effect is an event held the hot sun in the bottom layer of the Earth's atmosphere by greenhouse gases that form a layer in the atmosphere. Greenhouse gases trapping heat on Earth the way it absorbs the heat of the Sun and return to Earth. Supposedly, most of the heat of the Sun reflected into space. This causes the temperature of the Earth increases so that global warming is happening. The greenhouse gases that cause global warming encompasses a variety of air pollutants, such as carbon dioxide (CO2), methane (CH4), nitrous oxide (N2O), hidrofluorokarkarbon (HFC), and chlorofluorocarbons (CFCS). The amount of these gases continue to increase every year in the atmosphere due to human activities. The Earth's temperature continues to rise along with the increasing emission of greenhouse gases. Report of the Intergovernmental Panel on Climate Change (IPCC) in 2007 shows that currently have an increase in the Earth's temperature. The IPCC also concludes that such an increase is very likely caused by human activities that cause an increase in the amount of greenhouse gases in the atmosphere. -Increase the volume of sea water so that sea levels will rise. -Cause flooding in coastal areas. -Be able to submerge the Islands and big cities that are at the edge of the sea. -To increase the spread of infectious diseases. -Rainfall in tropical areas will be higher than normal. -The ground will dry more quickly, albeit often exposed to rain. This will lead to soil drought many plants die. Thus, in some places may be experiencing food shortages. -Will often occur in various places of the big wind. -The migration of animals to the area cooler. -Decimation of animals and plants including humans, who was unable to move or adapt to higher temperatures. Rising global temperatures are also expected to lead to other changes, such as increasing the intensity of extreme weather events and changes in the amount and pattern of precipitation. The intensity and pattern of monsoon season in various parts of the world the more aberrant, including Indonesia, have indicated the occurrence of world climate changes due to global warming. In addition, the year 2007 IPCC report also stated that there has been an increase in sea level since the year 1961 with an average increase of 1, 8 mm/year since 1993 and became a 3.1 mm/year. The onset of melting ice and snow also evidenced by looking at the decline in the broad scope of the ice and snow at the North Pole, i.e. as much as approximately 2.7% per decade (10 years).